Im a Brit but based in Bahamas who will be spending the next few years cruising the Med, with possibly a crossing to Nassau in late 2020. Just acquired an Aquastar 65 (a proper little ship) and looking for some help. 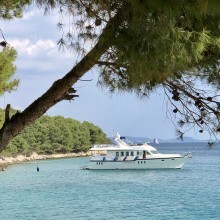 She's based in Croatia and, after a period getting to know her, will cruise down to the Ionian then left to the Aegean or right to Sicily - tough having to make decisions! I have my ICC and have previously cruised the Med for three years in an Oyster 61. Do let me know if you are interested - emphasis will be on fun, experiences, new places and chilling out.